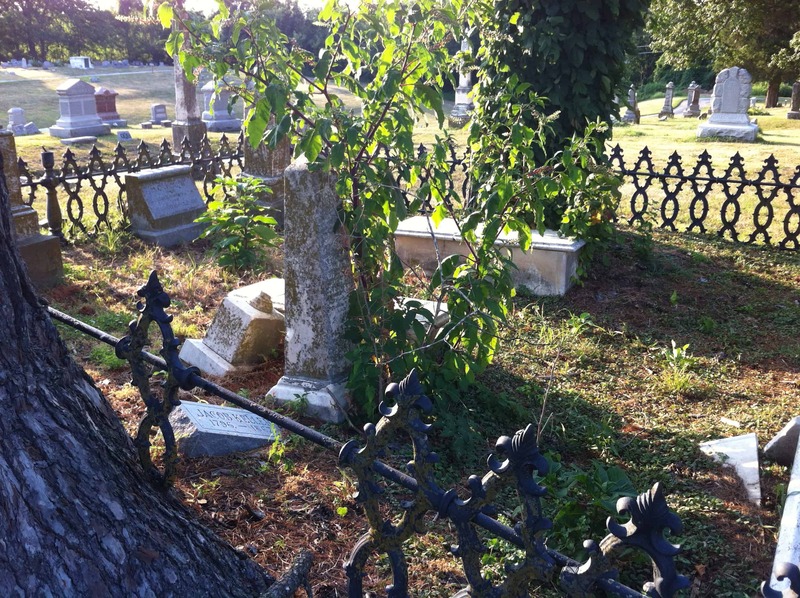 For those of us who love a walk or a picnic in a beautiful old cemetery, or for those people who simply like to look at photos of historical locations, I give you part 1 of a 3-part series (wow, that sounds fancy) of photos of cemeteries from my home town… Lexington, Missouri. Several days ago I went back to visit the family and was inspired to drop by all of the cemeteries in town. Though I have interesting connections and memories from 2 of the 3, I had forgotten (or maybe didn’t realize it before) how truly cool these historic pieces of land are. I think many people from Lexington don’t even realize that such beautiful and historical gems are just hanging out and waiting to be noticed. I wonder if this is the case with many small towns around the country. Although, I must say that part of what makes them so beautiful to me is the quietness and the fact that I was almost always alone for each visit. At each cemetery I brought a digital audio recorder along and had respectful conversation with any spirits who may have been present (hopefully there will be more about this in a future post). I’m not a photographer, but I hope you enjoy the photos. This entry was posted on Wednesday, July 4th, 2012 at 2:16 pm	and tagged with 1849, big seance, cemeteries, cemetery photos, cemetery video, digital audio recorder, electronic voice phenomena, electronic voice phenomenon, EVP, gems, graveyard, graveyards, historical cemeteries, lexington, lexington missouri, machpelah cemetery, missouri, missouri cemeteries, missouri spirit seekers, mo cemeteries, mo spirit seekers, mospiritseekers, moss, old cemetery, paranormal, picnic, quietness, seance, spirit voices, spiritual, travel and posted in Cemeteries, EVP Research. You can follow any responses to this entry through the RSS 2.0 feed. Nice photos, Patrick. I love cemeteries. They’re so peaceful. I like to visit my relatives in the graveyard across from my parents’ church. My greats and great-greats are buried there. I like your pic of the lichen on the iron fence best. Thanks, Lee! I’ve always loved them, especially growing up… but I’m only recently becoming obsessed with visiting and taking pictures. So peaceful. We share the fascination for graveyards. When on vacation, I always have to stop and visit for a few minutes. Nice photos! Macpelah has an interesting history. It was established by an act of the Missouri State Legislature and Lexington’s first settler, Gilead Rupe is buried there. At the northern edge, at the very back, there is what we used to call a “holler” or hollow that is the mass grave of the remains of victims of the Saluda Disaster. I visit nearly every time I go to see my Mom, as all my deceased relatives are buried there. I love cemeteries. They are important places left for posterity and for future generations to be able to appreciate and respect their own family roots, heritage, and the generally awesome people who came before them. They are the symbolic cities of the dead separate from the cities of the living, but not so separate that they would be forsaken or forgotten. In this age of cremation, a cemetery serves as a resting place for the ashes but is an important PLACE where people can feel able to pay respect to their dead or take some time to reflect on cherished memories, etc. where it is quiet and conducive to a solemn, peaceful visit. Cemeteries are tangible and beautiful and frankly, timeless treasures speaking to our past. Thank you for all the beautiful pictures Patrick. I grew up in Lexington and where we lived (and my parents still live) you could see Machepelah Cemetery. From the back windows of our house. I think that’s what started my fascination with cemeteries. My husband loves them as much as I do. In fact both of us have found things about our families and heritage that we had not known by exploration. Lexington will always be home no matter where I may live now. Thank you again and keep up the good work. Hi Patrick. Thank you for the beautiful pics. I also grew up in Lexington. I lived just down the hill and across the old railroad tracks from Machpelah Cemetery (my parents still live in the house) and could see it from the back of our house. I have many friends and family buried there. It is such a beautiful, peaceful place and I try to visit every time I go home. My husband and I and our children love to visit different cemeteries. There is so much a person can learn if they just open their hearts and listen.